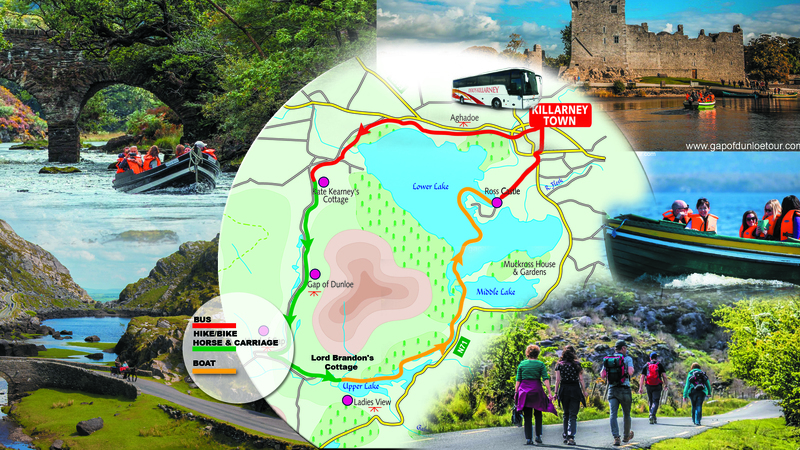 Boats depart from Ross Castle (in front of the Castle) daily at 10.30am.Enjoy the beautiful Lakes of Killarney for 1 hour 30 minutes. Arriving at Lord Brandons Cottage where lunch may be enjoyed on the banks of the River. The Hike Through the Gap of Dunloe is 7 miles/11 kms and as you are on your own you can “take all the time in the world”. Transport from Kate Kearneys Cottage may be arranged through this office with prior notice. Please phone 00353 64 6631251.